Sitting in a sparsely crowded bus station at 5 a.m. and sipping hot tea, I looked around. A few curious faces stared back at me. I was waiting for the daybreak. A sudden plan & I had packed my backpack, journeyed overnight and landed in a new place at the wee hours. And so here I was, waiting for the sunrise to take over the hostile darkness. In about an hour or so, there was light & we strutted in the small town to lookout for a place to stay. After checking some places (read negotiating the tariff) we finally dumped our luggage in an okay-ish room (clean+affordable is always a thumbs up for me). Without much delay, we set out on the roads to feel the mountain wind in hair. An impromptu budget trip is always fun and comes with a unique experience each time. 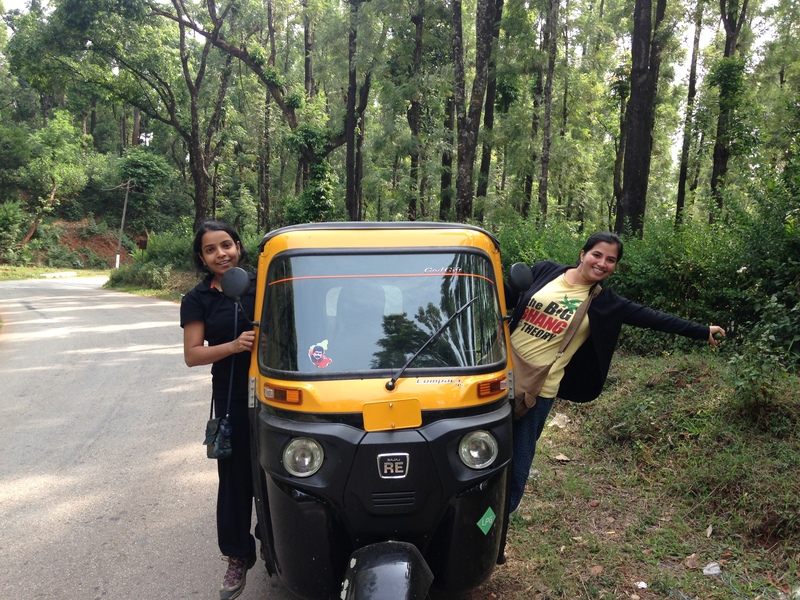 This time it was an auto ride all over the map of the coffee town of Chikmagalur! While everywhere else the scorching sun was being cursed, he seemed to have toned down his brightness settings for this part of the country. I was really happy with his decision – as I instantly fell in love with the place. It jogged my memory to the mist covered Himalayan hamlets, which are close to my heart! A rough auto ride (after an overnight bus journey) followed by a little trek was tiring. But what waited at the end of it was a sight for soar eyes! Abundant earth colors splashed all over, distinct forest scent & refreshing cool breeze stole all the weariness. Such a happy scene to look at! 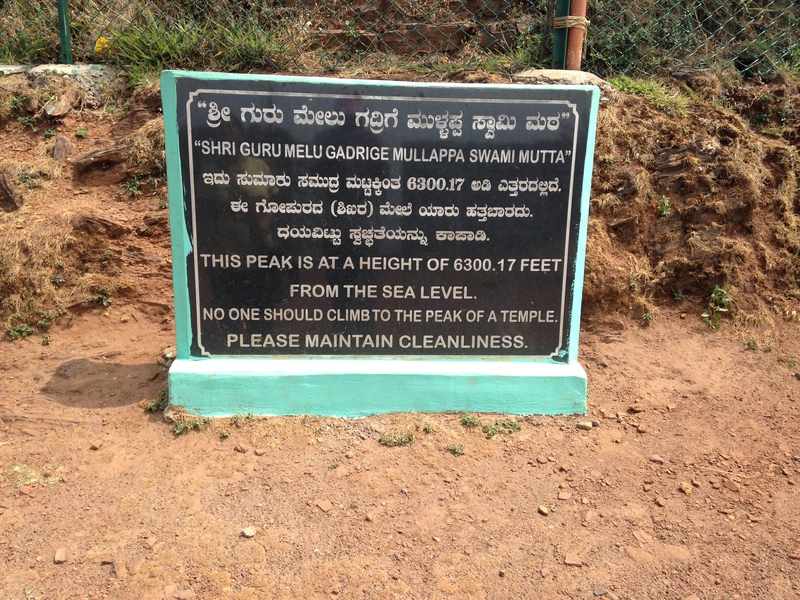 I was atop Mulayanagiri – the highest peak in Western Ghats spread over in the state of Karnataka, India. 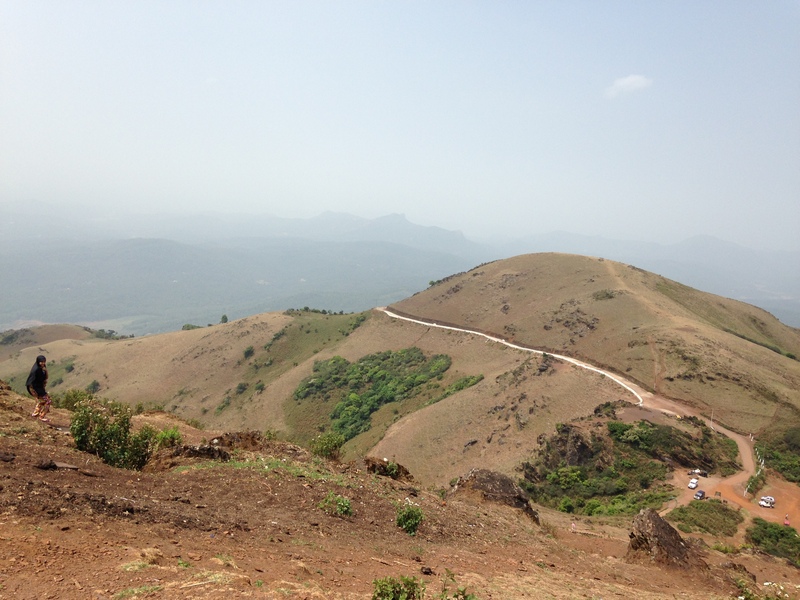 From the top of Mulayanagiri – not so great pan image, though. Deliriously roaming around and clicking pictures and soaking in the beauty of the place, next up was a trek (yet another one) through the coffee plantation to a Jhari (also Jerry) falls. A cascade carelessly falling, its gurgling sound – a song of nature, closely resembled an enchanted place from a storybook. First view of the Jhari falls. Tiny eh? wait & watch! We retired for the day as our heart and soul drenched with content. Following day started early as we headed for the Muthodi forests in a hope to spot tiger! Sadly, we did not spot it 😦 Here’s what you should do for better chances of spotting most animals, tiger (if you are lucky) included – start early, be there by 6 a.m. You can also avail a stay in the forest guest-house by visiting the Bhadra Tiger Reserve office in Chikamagalur (08262-234904). If you are in a bigger group (8-10 people) hiring a Jeep for about Rs. 4000/- turns out to be a better option and you can start the safari right away without waiting for more people to join in. We paid Rs. 1000/- (500 per person) for the safari. To beat the heat, Chikmagalur is one of the coolest (literally) places to visit. After enjoying some local shopping and purchasing coffee (Chikmagalur is called the ‘coffee land of Karnataka’) I bid adieu to the beautiful place. This looks like an amazing time!